It’s interesting, these days, watching the Sun (No, please, come back!). Last year after the failed patio gas canister bombings it clearly didn’t have the slightest idea how to respond to them: first with hackneyed blitz spirit type defiance; then scaremongering, and the resurrection of its demands to scrap the human rights act; and finally, resorting to patriotism, ordering everyone to fly the flag. This remember is the paper which over the 80s and up until recently was often considered the weathervane of the nation, or symbolic of how a majority of how it was responding, typified by how when it changed from supporting the Conservatives to New Labour that it was considered the final, death blow against John Major. Since then of course we’ve had the online revolution; now the most visited UK newspaper website is the ‘loony-left’ Guardian, closely followed by the Mail Online. Circulations continue to plunge, with the Sun recently slipping below the 3 million mark, only rising back above it because of price cutting. The real success story of today is the Daily Mail, and by far the most despicable, distorted press coverage of late, directed at asylum seekers and immigrants, has come not from the Sun but from the Express and Mail. Whether it’s because the Sun’s reflecting society at large or not, or that it’s lost its way as the country has become more liberal and has tried but failed to follow, it no longer has the zest or vim that it had under Kelvin MacKenzie’s editorship, as rabid as that was in places. The rot set in under David Yelland, the most memorable of his front pages one asking Tony Blair whether we were being run by a gay mafia, and Rebekah Wade, most notable beforehand for her “name and shame” campaign against paedophiles on the News of the World, has done little to change that. Even so, it’s surprising that it’s been so surprised by the vehemence of the response to its call for a debate on capital punishment. For years it’s been claiming without the slightest amount of evidence that judges are liberal loonies, that crime is getting worse while the figures suggest the opposite and that the criminal justice system is failing us all. The result of this campaign for “toughness”, led not just by it but by the other right-wing tabloids also, is both obvious and apparent; our prisons are now so full that there is little to no room whatsoever left in them. Of late, the rallying cry has been against binge drinking and youth, or rather “yob” violence. This was crystallised by the death of Garry Newlove, a loving, caring father kicked to death by 3 teenagers who had drank large amounts of strong alcohol and smoked cannabis beforehand. It’s one of those cases, like the murder of Rhys Jones, that pushes the press into a familiar period of soul-searching of how we’ve reached this lowest-collective ebb. The reality is of course that it’s an aberration, a terrible crime that is thankfully very rare. Nonetheless, it gave the Sun and Newlove’s loving widow, an opportunity: both want change, but for very different reasons. The Sun wants improved sales and to be able to crow about changing government policy, as well increasing its own influence; Newlove wants vengeance and for her husband’s death to not be in vain. Newlove, along with a shopping list of other demands, clearly stated how she longed to be able to personally execute the 3 boys who killed her husband. Never mind that even in most American states it would have been highly unlikely they would have been sentenced to death because the crime wasn’t premeditated, and that perhaps only in such freedom loving countries as China, Saudi Arabia and Iran would such a punishment have taken place, the Sun at the time didn’t speak up and say that it was personally against capital punishment. It did all it could to encourage a grieving, deeply hurt woman to keep going. Then, in quick succession, we’ve had other troubling murder cases, which due to their own individual circumstances have caught the public’s attention, or at least certainly the media’s. In Steve Wright’s, because he murdered 5 prostitutes with no apparent motive, not even a sexual one, and was apparently not mentally ill; and Mark Dixie’s, in that he stalked and killed a beautiful 18-year-old aspiring model, who had a whole string of portfolio photographs that the media could splash all over their pages. Yesterday Levi Bellfield was convicted of the murders of two young women, and suspected, like the previous two, of having potentially killed before. While the relatives of Bellfield’s victims haven’t spoken out yet, it won’t be much of a surprise if they too, like the next of kin of those killed by Wright and the mother of Sally Anne Bowman, Dixie’s victim, suggest that they would also like to see the return of the ultimate penalty. The Sun on Saturday then, presumably because of the response on its talkboards which are usually filled with individuals not always residing in this country demanding the restoration of capital punishment, set up an actual poll asking whether readers would like to see hanging back. The response seems on the surface to be overwhelming, and despite the Sun personally coming out against it. 99% of 95,000 wanted it brought back, according to their you the jury poll. The poll result is of course questionable; you can vote multiple times on the online poll, and doubtless can on the actual phone lines too. Even if you consider that it is a seemingly massive response, the Sun has over 3 million sales, which means that 3% of its readers’ responded and want it back. The Sun also claims to have an actual readership of 8 million, meaning that the figure goes even lower when you factor that in. Despite its past polls returning similar overwhelming results, the paper in this case genuinely seems taken aback by the response. The question has to be: why? Its attitude to crime has always been leading towards such a policy, even if it actually balks at the possibility. I very much doubt it’s because polls that are representatively sampled suggest around 60% or lower (albeit from a few years’ ago) are usually in favour of capital punishment being brought back, with even only 65% of Tory voters wanting hanging to return; rather, it’s because it’s greatly perturbed that its readers aren’t hanging off their every editorial word. The Sun is, first and foremost, pure propaganda, and it expects its line to be swallowed. Secondly, it almost seems worried that it can’t control what it’s started off. As Tim Ireland writes, it almost seems as if the paper is trying to control the mob it set in motion. Wade couldn’t do it when she named and shamed paedophiles and a paediatrician ended up being hounded out; how on earth could she manage it now? In any case, she’s making an attempt: as well as listing all the relatives of victims who want capital punishment back, the paper remarks on how Sara Payne, one of those whose line in criminal justice policy based purely on her own experience as a victim has been pushed relentlessly in the paper, doesn’t want it back. It points out how Pierrepoint didn’t believe that it was a deterrent (although Wikipedia asks whether this was just a selling tactic for his book), without mentioning how he, merciful and humane despite his role as executioner, was only interested in making sure that the end for the person being put to death was as painless and quick as possible, something at odds with many of those calling for its return, who clearly want those put to death to suffer. It even says that the hated Germans brought hanging to this country, almost as if wanting to put its readers off it by its pure heritage; the page 3 girl, the paper’s purest piece of propaganda, asks for life to mean life rather than for capital punishment; and only two of the Sun’s gor blimey commentators, both of them the loathsome talk radio hosts Jon Gaunt and Fergus Shanahan, want it back. THE clamour for the death penalty is deafening. Some 99 per cent of 100,000 voters in our poll demand its return. Such an overwhelming response is no surprise after the killings of Garry Newlove, Sally Anne Bowman and the five Suffolk Strangler victims. Not to mention the anarchy that has erupted in some parts of Britain. No one reading the heart-rending interviews with any of the victims’ families could fail to understand their desire for the ultimate revenge. Most of us share it. But The Sun does not believe in capital punishment. It will not be brought back on a wave of public emotion, however much we sympathise with it. Yet that is exactly what it has wanted by giving over so much space to Helen Newlove and others. Helen Newlove claims in her own case for why it should be brought back that it isn’t about revenge or vengeance – yet anyone reading her demands and frankly chilling account of how she’d like to execute her husband’s killers couldn’t fail to realise that was exactly the motive on which she was acting. Emotion or revenge cannot possibly even begin to be a part of any justice system which is going to attempt to be fair – yet by not pointing that out forcefully enough the Sun has failed those that it’s given such succour to. Demands for capital punishment are only so strong because the justice system fails at every turn. Too few police. Too few arrests. Too few offenders being locked away because there are too few jails and, scandalously, they were allowed to become too full. Too few judges taking public safety seriously. And far too many serious offenders whose “life” terms mean nothing of the kind. Except we’ve got almost the most police ever. How can you possibly say too few offenders are locked away when there’s currently 82,000 in prison and we are among the most heavy users of prison as punishment in Europe? Yes, the jails are too full, but that’s not just the fault of the government but of the very same newspapers that have demanded ever tougher punishments, got them, and then demanded even harsher sentences. Despite common belief, life sentences have never meant life in this country, and the time served for a life sentence has actually continued to rise since the abolition of capital punishment. Believe it or not, and I’m sure I’m not the only person who thinks this, our current justice system model gets it about right. The occasional cases where it either gets it wrong, with both miscarriages of justice and with those who either get away with it or kill again needed to be taken into consideration, are relatively few. Revenge is the real motivation behind the calls for the return of capital punishment. That’s not enough in a civilised society. And who knows just how the average supporter of capital punishment will take to being spoken to in such a tone by the “reactionary” Sun newspaper? This is a guest post. Obsolete wrote this first on his blog. 'Septicisle' is a regular contributor to Liberal Conspiracy. He mostly blogs, poorly, over at Septicisle.info on politics and general media mendacity. No, life sentences have *always* meant life and continue to do so. A criminal who’s sentenced to 10 years imprisonment can be released on parole before the full length is up, while remaining subject to recall to prison if she breaches her parole conditions. This does not mean she didn’t receive a 10-year term in the first place. Similarly, someone who’s sentenced to life imprisonment is on parole and subject to recall if they break parole conditions until the full length is up – i.e. for the rest of their life. This is one of the most patronising pieces I have ever read. Are readers of the Sun (I know several) really a “mob” which needs to be “controlled”? Are the editors supposed to be somehow worried that riots and lynchings might break out at any moment? Opinion polling I believe suggests that around 50% of people would restore capital punishment. Are they all members of the Sun-reading “mob”? Well there should have been more places built sooner. Simple. And criminals are not sent to prison on a whim, are they? Only after *multiple* convictions in most cases. Prisoners up = most crime down. The policy which you appear to despise seems (so far) to have worked, doesn’t it. define “worked”? I mean reoffending rates haven’t dropped and people are being put in to prison for barely any reason these days, when community orders and compulsory programmes would be much more efficient at combating the long term crime statistics and wouldn’t actually cultivate a situation where reoffending is the best option. The prisons are only full because the government gave in to the whim of people that agree with the sun and made changes to appear much tougher on crime. I don’t have a great faith in this people of this country in general, so I personally would categorise a great deal of that 50% in to the “mob” category when it comes to subjective, emotive subjects. I’ve only met a mere handful that ever manage to eloquently put a case for the death penalty that I can only disagree with on personal preference terms. cjcjcj: No, not at all. What I find fascinating, as expressed in the piece, is that the Sun routinely demands the harshest penalties around, makes the most out of the most rarest and disturbing crimes to conclude that the whole country’s going to hell in a handcart, often recruiting the victims’ families to mount their own campaign for change, which often involve them calling for the return of capital punishment without the newspaper at the time ever saying it doesn’t agree, and then it seems thoroughly worried to the point of shock when the same readers then demand what they’ve often given legions of space to. As said in the piece, even the 95,000 that phoned the hotline, if you even accept those are all separate individuals, make up only 3% of the Sun’s actual sales readership. 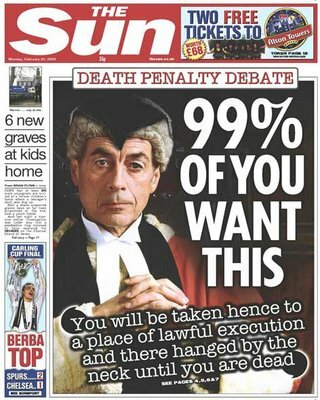 I’m certainly not suggesting that all those in favour of bringing back capital punishment are a Sun-reading mob, far from it, but as even the Sun admits, most, far from considering it an active deterrent, for which there’s little evidence, simply want it back so those who dealt out death themselves are also executed. Revenge simply can’t be a part of a criminal justice system. a little bit of history goes a long way. By the way I not quite sure how splashing its vote results on the front page constitutes any kind of attempt to puncture anything or to calm things down? I thought I pointed out throughout the piece how it seems to be doing just that.